There are two features in Accounts Payable relating to Active Vendors and Selected Records that are described below. 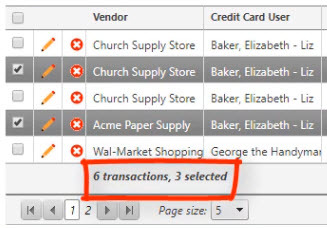 Vendors can be marked as Active or Inactive. This feature allows you to filter Active, Inactive, or All vendors on the Vendor Information page and allows you to view only Active vendors when performing a vendor search. The first tutorial walks you through this process. When selecting records on a grid, you may have multiple pages of records. The number of records selected that displays at the bottom of the grid includes all the pages. The second tutorial walks you through an example of this functionality. For a visual tutorial, see the View Active Records / Selected Records video. 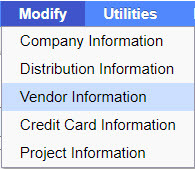 From the Accounts Payable menu, select Modify -> Vendor Information. Click the Edit Icon to view the Vendor. Click the Active? checkbox to make sure this vendor shows up in searches. NOTE: Inactive Vendors do not appear on lists or labels. From the Filters bar, click the Active? drop-down and choose one of the following options: Show Active Only, Show Active and Inactive or Show Inactive Only. From any place in the financials where you are looking for a vendor, click the Only Active? checkbox to exclude inactive vendors from the search. 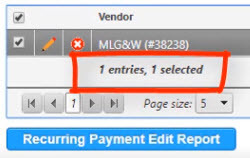 NOTE: Uncheck this box to view all vendors. 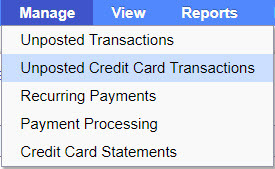 From the Accounts Payable menu, select Manage -> Unposted Credit Card Transactions. The number of selected records displays at the bottom of the grid. NOTE: This includes records selected on other pages if you have multiple pages of records for your grid listing. This option can also be found on the Manage Recurring Payments grid.